Scientists at Tokyo Institute of Technology and colleagues in Japan have synthesized two crystal materials that show great promise as solid electrolytes. All-solid-state batteries built using the solid electrolytes exhibit excellent properties, including high power and high energy densities, and could be used in long-distance electric vehicles. Scientists at Tokyo Institute of Technology and colleagues in Japan have synthesized two crystal materials that show great promise as solid electrolytes. All-solid-state batteries built using the solid electrolytes exhibit excellent properties, including high power and high energy densities, and could be used in long-distance electric vehicles. The findings are published in Nature Energy, online 22 March 2016. High power batteries are desirable for numerous applications, including the electric vehicles of the future. These batteries must be rechargeable, remain safe to store and use at variable temperatures, and retain charge for a considerable length of time. Now, Yuki Kato and Ryoji Kanno in collaboration with colleagues from Toyota Motor Corporation, Tokyo Institute of Technology and High Energy Accelerator Research Organization (KEK) in Japan, have successfully designed and conducted trials on novel, high power all-solid-state batteries with promising results. Most traditional batteries rely on the flow of ions through a liquid electrolyte between two electrodes; the lithium-ion batteries used in mobile phones would be one example of this type of battery. However, batteries incorporating a liquid electrolyte are prone to problems, including low charge retention and difficulties in operating at high and low temperature. 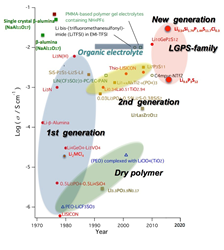 Previous designs for solid electrolytes have shown promise but have proven expensive and some have exhibited problems with electrochemical stability. Kato and his team synthesized two new lithium-based ‘superionic’ materials based on the same crystal structure previously discovered by the same team. They studied these crystal structures using Synchrotron X-ray diffractometer, BL02B2, at SPring-8 and neutron diffractometer iMATERIA(BL20) at J-PARC. Superionic materials are solid crystal structures through which ions can ‘hop’ easily, essentially maintaining a flow of ions similar to that which occurs inside a liquid electrolyte. They showed how the lithium ions move fast in the structure of their compounds even at room temperature. Both superionic materials developed by the team showed extremely high ionic conductivity and high stability. The researchers used their two new solid electrolytes to create two battery cell types; one high-voltage cell and one cell designed to work under large currents. Both all-solid-state cell types exhibited superior performance compared with lithium ion batteries, operating very well at temperatures between -30 and 100°C. Kato’s team found that the cells provided high power density, with ultrafast charging capabilities and a longer lifespan than existing battery types. Although the technology requires further development before it is commercially available, these promising results indicate that all-solid-state batteries may soon provide a much-needed boost to applications requiring stable, long-life energy storage. Most batteries and capacitors we use in daily life are powered by liquid electrolytes. Rechargeable lithium ion batteries, for example, work by maintaining a flow of ions from the negative electrode to the positive electrode during use, and the ion flow is reversed during charging. Although lithium ion batteries are useful for these purposes, there is still strong demand for new devices with higher power and energy densities. All-solid-state batteries are the most promising candidates for future battery systems, due to the high energy density attainable by direct-series-stacking of battery cells. However, the low power characteristics of all-solid-state batteries, due to their higher solid electrolyte-resistivity than conventional liquid electrolyte, still remain unsolved. The search for materials suitable for creating solid electrolytes has already produced some prototypes. So far, these ‘superionic’ materials, which allow ions to move quickly and freely through their crystal structure, have been developed using the expensive element germanium – researchers are therefore keen to find alternative superionic conductors that could provide the basis for all-solid-state batteries. The development of two new lithium-based superionic conductor materials (structures: Li9.54Si1.74P1.44S11.7Cl0.3 and Li9.6P3S12 ) by Yuki Kato and his team represents a leap forward in the creation of useable solid-state batteries. Their two cells based on the novel solid electrolytes performed very well in trials in comparison with lithium ion batteries. The cells remained stable and operated consistently at a range of temperatures between -30 and 100°C. They exhibited high energy and high power densities, and very small internal resistance levels. Their properties would allow the cells to be stacked close together without interference. Further, the cells exhibited ultrafast charging, retained their charge for lengthy periods, and appeared to have a long lifespan with excellent cycling ability (after over 500 cycles, the cells retained around 75% of their initial discharge capacity). These promising results require further investigation prior to commercialization. The addition of high energy electrodes into the solid-state cells could enhance the power of the batteries still further. Also, processing technology to complement the batteries that would allow for battery stacking is required before such configurations could be fully tested. Kato and his team are hopeful that their new materials will pave the way for all-solid-state batteries for multiple applications, including long-distance electric vehicles, in future. This research is partially supported by New Energy and Industrial Technology Development Organization, Japan (NEDO).